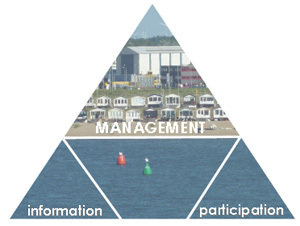 Below is a brief description of the primary components of the the Ecosystem Based Management System. Click here for a short presentation on the EBMS. Click here for a pdf with a comprehensive explanation of the EBMS. Alternatively click here for a lecture about the EBMS by Professor Rafael Sarda. Management is about making decisions to reach some kind of aspiration or desired state. In this context, management of environmental public goods and services is about making the best decisions for societies; maintaining the provision of these goods and services and conserving the functioning of the systems underlying these services. Standards, sets of rules for ensuring quality are widely used in industry and many fields of management to ensure quality and accountability. We have developed a standard operating procedure to conduct the EA, called the Ecosystem-Based Management System (EBMS). The EBMS provides the structure for more integrated management, a vision driven process, based on the development of a precautionary approach. The EBMS is a three pillar structure. The managerial pillar, the basis of the system, is a formal Environmental Management System the information and the participatory pillars provide the inputs required for functioning and performance of the managerial system.